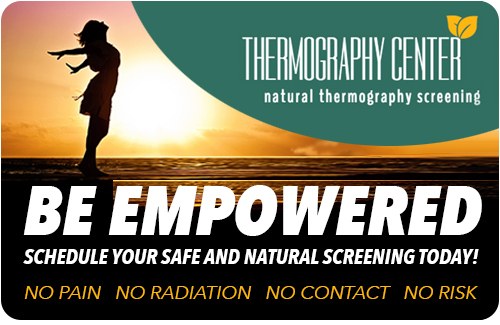 The thermography procedure is simple, quick and painless, so relax and know you’re in expert hands. A Certified Clinical Thermographer performs the screening, which takes place in a temperature controlled cool environment, with the thermographer and patient following specific protocols. The natural breast screening test takes place in a relaxed, peaceful & private room. The room air may feel cool on your body as you adjust to room temperature before scanning but you will be lightly robed during the cooling process (about ten minutes). Examination room temperatures are slightly cool, but comfortable once you disrobe down to your underwear for the image taking. Any apprehension about the sophisticated thermography equipment is soon dispelled as the procedure is totally non-invasive. The camera in these no-radiation breast screenings do not emit radiation of any kind. Time before results are reported to the doctor or patient varies from seven to ten days. If you have an urgent request for a 24 hour turn around, please discuss with your Thermographer for an additional $50 fee. You are welcome to bring a companion or partner to be present at the examination.